A few yards short of the very busy Korangi crossing in Karachi, a series of makeshift settlements set up by nomadic clans is attracting a lot of attention. The family profile of these matriarchal clans is almost identical. Headed by a woman, they comprise of one or two men, children and a few camels with their calves. Their main source of income is the sale of camel milk. People stop their cars, motorbikes and bicycles and form queues to buy this nutritious milk, which has recently gained popularity in Pakistan. The most sought-after property in camel’s milk is freshness. Cynical buyers, therefore, insist that the camel be milked in front of them. The technique is simple. Calves are brought close to the mother’s udders and when they begin to nudge her to be fed, milk starts flowing into the udders. At that moment, calves are harshly pulled away and their share of milk is taken out by skilled hands into stainless steel buckets or in a thermos or utensil provided by the more hygiene-conscious buyers. But hygiene, in most cases, is less than satisfactory. These families, living in the open, lack proper facilities of sanitation. While the milk has no impurities, their hands and utensils are often not clean. And with the common belief that one must never boil camel’s milk, the bacteria transferred from unwashed utensils remain alive. “We don’t boil camel’s milk. It should never be boiled. I buy it every week for my wife who complains of lethargy, weakness, aches and pains,” says a regular buyer, who almost walked away empty-handed when he saw a girl adulterate the milk with water. Within the last few years, camel milk patrons are increasing in number. Despite having a thin consistency, salty taste and slight odour, the milk has created a market for itself in the country due to its potential medicinal benefits. The imported version, bottled with preservatives, is commonly available in high-end grocery store chillers. 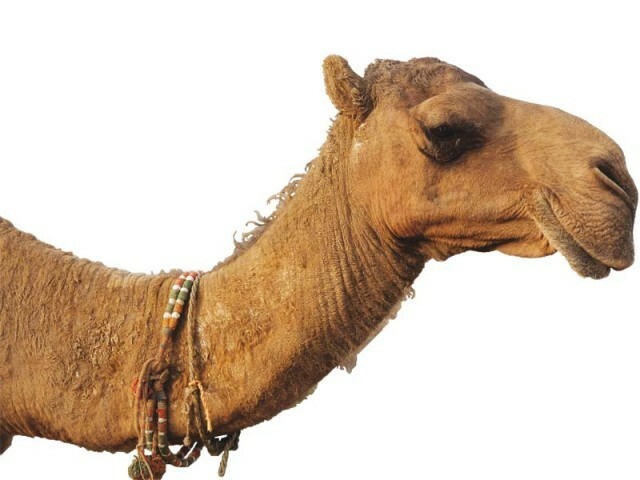 From virility in males to obesity control, the benefits of camel milk as a form of treatment are many. Wali Muhammad Akhtar, one of the most senior staff members at Dawakhana Hakeem Ajmal Khan in Saddar, Karachi, confirms that camel milk is beneficial for health. “It is Sunnah of the Prophet (pbuh). How can it not be beneficial?” he says. “It has less fat content so we use it in medicines to cure obesity. It is also the main ingredient of a popular herbal product called Labub Kabir Ajmali (an aphrodisiac for men),” says Akhtar, adding that the medicine’s recommended dose is half a teaspoon before breakfast. While assessing the product in light of the Avicennian alternative branch of medicine, commonly known as hikmat, Hakeem Ajmal, named after his great grandfather, confirms that camel’s milk is used in some of the Dawakhana’s 350 plus products. According to him, the ingredient is used in its original form instead of an extract or essence. “Camel milk is hot and dry in temperament,” explains Ajmal, referring to Avicenna’s theory of humours. There is mass consensus among health practitioners regarding the potential health benefits of camel milk. Nutritionist Tayyaba Khan says that the milk is nutritionally very rich. “It has Vitamin C which helps boost immunity. It is also rich in iron and Vitamin B. It helps with diabetes management and is fortified with minerals.” Diabetics are therefore leaning towards camel milk as a possible course of treatment with no side effects. According to reports, camel milk has about a quart of insulin in each litre, making it a potential treatment option for diabetics. India’s Bikaner Diabetes Care Research Center conducted a study on the effects of camel milk on type 1 diabetes, determining that consuming camel milk significantly reduces insulin doses required to maintain long-term glycemic or blood sugar levels. Zahida, a 50-year-old diabetic, has just begun using camel milk as a form of alternative therapy. When asked who prescribed it to her, she says, “Suna hai logon se (I have heard about it from people),” and feels that since it has no harm if no benefits, then why not give it a try. But according to Akhtar, to reap those benefits, one should first boil camel milk. With proven benefits, it is hard to determine why camel milk is still not a common or popular choice and has a growing, but niche market. One of the reasons could be an inherent social prejudice against the animal which is associated with low economic value and underdevelopment, herded by the Bedouins and nomads. There seems to be a social hierarchy in animals as well: The camel is a symbol of the working class while a horse represents grandeur and status. Mules and donkeys rank even lower on the social ladder, although donkey’s milk has been used since centuries as a beauty product, especially an anti-aging agent, with tales of Cleopatra bathing in it. “We buy camel milk for Rs40 per kg. 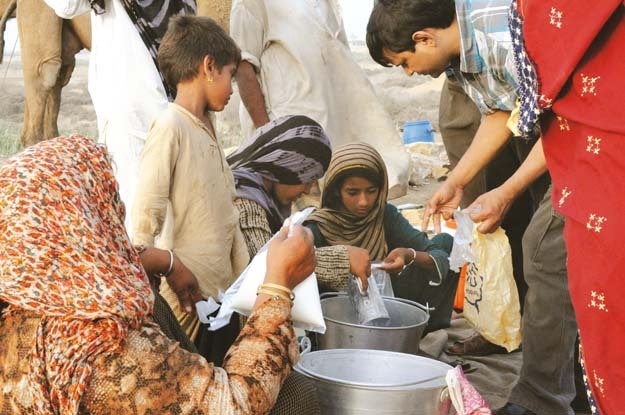 We don’t drink camel milk commonly despite its easy availability in Rohi (Cholistan Desert). We just use it to make kheer,” says Nazeeran Bibi, who lives in a village near Bahawalpur. In urban centres, however, prices are expectedly higher, and online sellers have cropped up to meet the increasing demand. 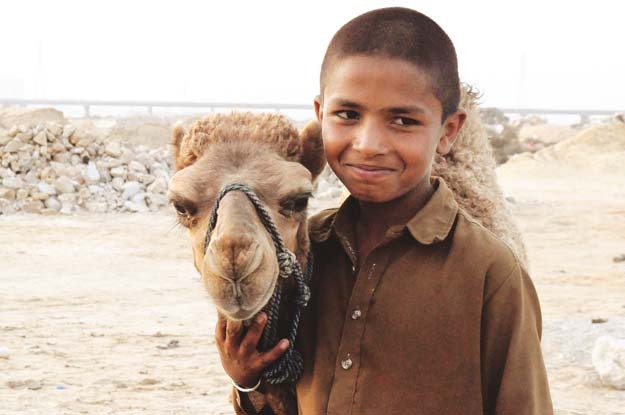 “We have camel milk which is very suitable for hepatitis, cancer, sugar and liver disease,” claims a Karachi-based website for camel milk that offers door-to-door delivery service. With the emergence of a new market for camel milk, further urbanisation of families like that of Goshi, in her late 40s, who has moved to Karachi from Jhang, Punjab, is expected. Unlike others who claim that they have borrowed their camels for a period of four months from camel farmers, Goshi says that she owns the animals. Her nine-year-old son, Ali Raza, plays with a calf and kisses it affectionately. “His name is Baby. He is one month old.” Ali does not go to school and spends his time herding camels, relying on the sale of the animal’s milk for a livelihood till the season comes to a close. Farahnaz Zahidi works as a senior subeditor at The Express Tribune. Published in The Express Tribune, Sunday Magazine, May 31st, 2015. Posted in Health and tagged camel milk, diabetes, hakeem ajmal dawakhana, Health, Pakistan. Bookmark the permalink.